4th-and-8 converts around 38% league-wide and a 39-yard field goal is successful 77% of the time. 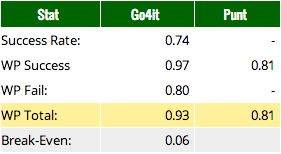 The edge is ever so slightly toward going for it (as the break-even point is a 34% conversion rate), but it is so close that any non-normal factors would have a sizeable impact on the decision (like starting your backup quarterback). As a pretty big underdog, however, it is necessary to play high variance strategies, and going for it in that situation is certainly high variance. Kudos to the Bills. But, that was not the decision that ultimately sent this game to overtime. Up seven with around three minutes left, the Bengals had the opportunity to seal the game. Facing a 4th-and-1 (after having converted a 3rd-and-1 four plays earlier), the Bengals decided to punt from their own 46-yard line. 4th-and-1 converts at 74% and a conversion results in a 97% win probability. A punt gives the ball back to the Bills, up only one score, which equates to an 81% win probability for Cincy. 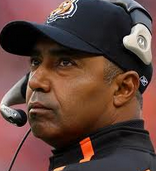 Marvin Lewis sacrificed 12% win probability by punting in that situation—and it almost cost him dearly as the Bills would force overtime. Luckily for the Bengals, they were able to recover from the mistake and eke out a win in overtime. It is those marginal decisions, though, that can have a tremendous impact on a season with such a small sample size. Anonymous: I suspect that field position doesn't matter all that much when there's 2+ minutes on the clock. Moving the ball down the field rarely seems like much of a challenge when the opponents are in defenses designed to stop big plays, and when you're always going for it on 4th down. Still, there's no way ~30 yards would only be a difference of 1 percentage point. 74% on a 4th and 1 also seems a bit high, as does 38% for a 4th and 8. EpicWestern, teams have converted 209 of the 607 plays on 4th and 7-9 yards since 1999 according to pro-football-reference.com, which is 34.4%, and that includes a number of fake/botched special teams plays. My guess as to the 1% difference between the punt/failed 4th down is any time left on the clock gives the offense time to respond in regulation, so giving the other team the ball closer to the end zone has hidden advantages. Also it was a 7 point lead so any difference in winning percentage is havled due to overtime (vs a 4-6 point lead). That said, it still seems like it should be bigger than a 1% difference. I agree, I thought it looked weird to have only the 1% difference, but I came to the same conclusions as James and Bill in that field position at that point is not a huge deal as well as the effect of time remaining. James: 34.4% is significantly lower than 38%. Also that sample represents only the plays in which the coaches felt that going for it was the superior play. We don't know what the numbers would be if all the teams that decided to punt went for it instead. It should lead to even lower numbers.